Handoff latency affects the service quality of real-time applications. 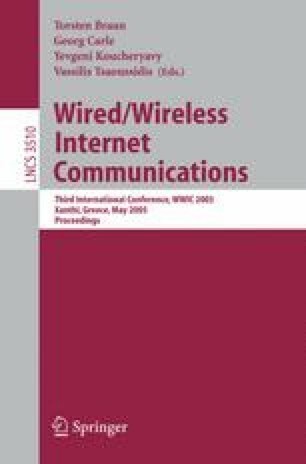 In this paper we develop an analytical model to analyze the Mobile IP Fast Authentication protocol (MIFA) and compare it to Hierarchical Mobile IP (HMIP). The study compares the signaling costs of the protocols as well as the overall load for packet forwarding. Our study shows that MIFA minimizes the packet delivery cost compared to HMIP. Additionally, MIFA is more efficient when the arrival rate of the packets increases. Thus MIFA outperforms HMIP with respect to signaling cost. From the performance point of view MIFA performs similar to HMIP when the domain consists of two hierarchy levels only, and outperform HMIP otherwise. However, MIFA does not require a hierarchical network architecture as HMIP does.